This provides an update to my previous post, The Final Four Seasons of the U.S. Dollar, which was an attempt to put future events related to the U.S. dollar in sequential order. Two years have passed, so we have more data available now to show what has happened. We also have some new warning signs to watch in currency and silver markets to let us know when we are getting close to the cataclysmic events. 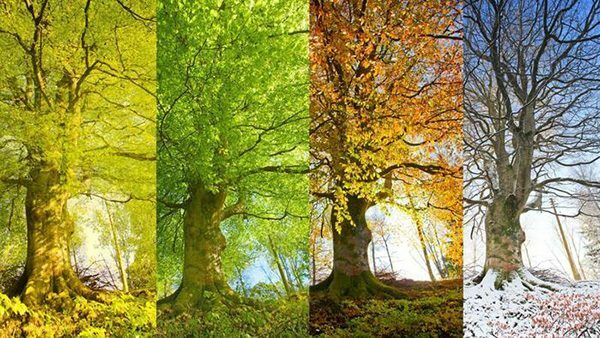 I identified four seasons ahead for the U.S. dollar. Currently, we are in season one, which is a time when the dollar grows stronger against other currencies. When I wrote the original post in February 2015, the dollar was already gaining value. 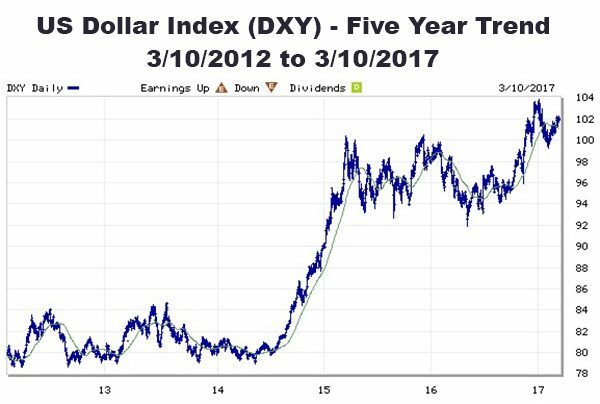 In the past two years, the upward trend has continued, especially in the past six months, as measured by the U.S. Dollar Index (DXY). After hovering in a narrow range from 80 to 82 during most of 2012, 2013, and 2014, the index started climbing sharply in the second half of 2014. It then leveled off in the upper 90’s until late 2016 when it started moving up again, which is continuing today. I am expecting it to continue moving higher due to interest rate hikes by the Fed and increasing problems for other major currencies, especially the euro and Swiss franc. The Fed is expected to announce another rate hike next week and more are likely to follow later this year. Season two begins with the sudden devaluation of the dollar, which I saw in a dream on July 7 2014. The dream showed representatives from the U.S. standing up at the U.S. table in a huge assembly hall where all nations were gathered. The stand taken by the U.S. representatives caused great turmoil as representatives from other nations yelled for them to sit down, but they refused. I believe their stand and refusal to sit back down symbolized the strong stand taken by the Fed raising interest rates, which has contributed to the strengthening of the dollar. Then suddenly, unseen shadow figures seated across from them at the U.S. table pushed the table over, knocking the men to the ground with the edge of the table pinning them to the floor. That triggered a collapse of our financial system and caused an inverse ETF (FAZ) to skyrocket. Although the whole dream was not fulfilled in 2015, the first part of it clearly started as the U.S. representatives took their stand and refused to sit back down, as shown by the soaring dollar index in the chart above. It climbed from 80 when I received the dream to over 100 in 2015. So when God said, “It is going to come next year,” I believe He meant the first scene would begin in 2015. Unfortunately, I wrongly assumed He meant all of it would happen by the end of 2015, but He did not say that. So, I watched for it throughout 2015, but eventually realized the timeline was much longer. The dream also showed the stand taken by the U.S. representatives caused financial hardships for other nations and they started yelling and demanding the U.S. representatives sit back down. The fulfillment of this part of the dream also started in 2015, as I documented in a previous post. As the dollar index soared, tensions between the American people have also soared. If tensions could be shown on a graph, it would likely look similar to the dollar index graph, moving up sharply and still going. Our country is more divided today than ever before. Tensions increased throughout 2015 and 2016, mostly centered around the Presidential election, but it did not end with the election. It has increased even more since then with protests, death threats, and an unprecedented insurrection led by President Obama. A prophetic word from Mena Lee Grebin warns of total chaos coming to America this summer, which would increase tensions even more. The soaring dollar index, complaints from other nations, and soaring tensions are three signs confirming what I saw is still coming, but a fourth sign was also fulfilled. Two weeks after posting The Final Four Seasons of the U.S. Dollar, I received a dream revealing what I called The Event Before the Event. In the dream, I saw a proposal was given to President Obama for a $200 million military project. I saw him increase the amount to $1.2 billion. The sign was fulfilled eleven months later in February 2016 when President Obama authorized spending for a rocket used by the Air Force to launch defense satellites. I documented how that event fulfilled every detail of what I saw. Amazingly, the project was for a rocket, which I believe was a reference to when I saw a certain inverse ETF (FAZ) shoot up like a rocket, which I documented in a post, Warning Sudden Economic Collapse Coming in 2015. In addition to those warning signs, I have received new insights showing other events preceding the sudden collapse. In February 2016, I received a dream showing a karate fight between the US dollar and Swiss franc. I originally expected to see the fulfillment of it right away, but later realized it revealed a macro perspective, which makes it even more valuable because it shows the sequence of future events in currency markets. The karate fight included three scenes. In the first scene, the US dollar fighter delivered quick slaps to the Swiss franc fighter, which stunned him. I believe the quick slaps were what I saw in a separate dream showing the price of USD/CHF (forex pair) increasing very fast to 1.35, then bouncing around in the 1.12 to 1.35 range. 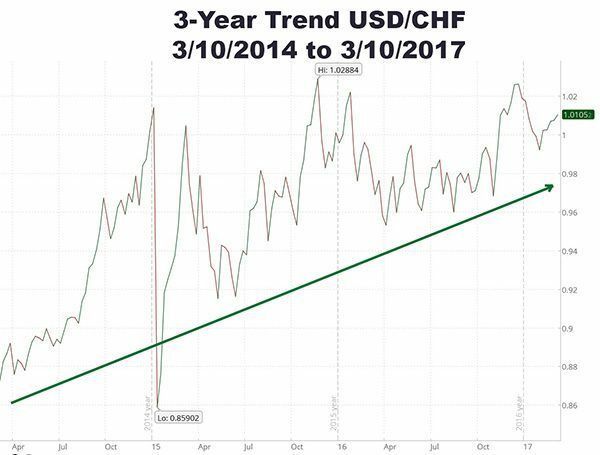 As shown in the chart below, USD/CHF has moved up over the past three years. The current price is 1.01, so it is not even close to 1.35, so what I saw remains in the future. I am expecting to see increased volatility in currency markets due to increased trouble around the world. Sadhu Sundar Selvaraj saw war starting this year in the Middle East, which would be a big blow to the euro and Swiss franc. Also, a growing populist movement in Europe is threatening to unravel the EU, which would also cause the euro and Swiss franc to drop. Whatever the cause, I am expecting to see those quick slaps with USD/CHF quickly increasing to 1.35 prior to the next scene from the karate fight dream. In the second scene of the fight, the Swiss franc fighter delivered a dirty punch to the US dollar fighter, which caused him to buckle over in pain and caused his face to turn red. I believe the dirty punch is the sudden event when the table gets pushed over and the U.S. representatives get knocked to the floor. The fighter bending over represents the dollar devaluation. His red face represents losses in our financial markets. In the third scene, the USD fighter delivers a flurry of super fast punches, which finishes off the CHF fighter. I believe that represents the collapse of the Swiss franc with the price of USD/CHF go up to 23, which is what I saw in a dream on August 20, 2015. For traders, that event offers huge profit potential. Quick Slaps – USD/CHF soars very fast to 1.35, which is a sign to watch for to let us know the bigger event is next. Dirty Punch – Sudden devaluation of the dollar and crash of financial institutions as FAZ skyrockets. Finish Him – Collapse of the Swiss franc as USD/CHF soars to 23. I expect the euro will collapse at the same time, but that was not part of the dream. Another sign comes from Pastor David Lankford. In early 2013, he received a prophetic dream showing the price of silver dropping way down to $20.00 and the euro dropping down to 80 cents. Then he saw the price of silver skyrocket. My interpretation is he saw the same events I saw, but from a slightly different perspective. He shared the details of his dream in an interview with Trunews on May 20 2013. At that time, he estimated he received the dream about two and a half to three months earlier, which would be approximately March 1 2013. At that time, silver was at about $28.70 and dropping fast, as shown in the graph below. And then when it got in my sight, I saw $20 or thereabouts. Then all of a sudden, it exploded and went back to the top. You know you see those commercials where the little thermometer explodes at the top? Well, the silver shot up until it exploded and it went so high that I could not see how high it went. It skyrocketed until it was totally out of sight. I cannot say how high it went or when it stopped or anything. With the benefit of hindsight, we know the drop in early 2013 was not what he saw in his dream because the euro did not drop to 80 cents and silver did not skyrocket, so his dream remains unfulfilled today. Silver is currently at $16.97, far below $20.00, so for his dream to be fulfilled, it must first move way above $20.00. This gives us a helpful sign to watch because it precedes the coming cataclysmic events. The price of silver moves up, far above $20, then drops back down. (Note: I believe it will first drop to at least $14.45). 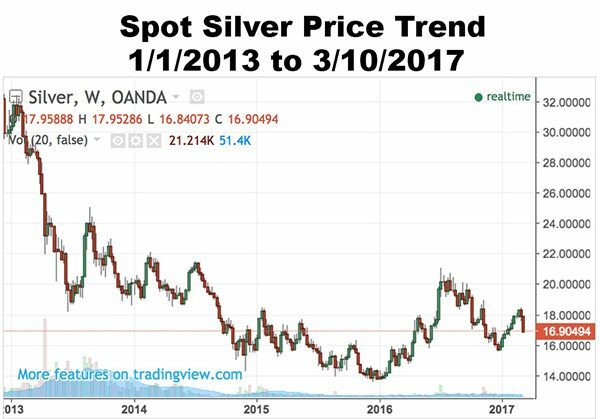 Just speculating, but the rise in silver might coincide with a drop in equities as investors realize the country is broke and unable to pay for Trump’s plans. Season one reaches a climax as Fed rate hikes combined with problems in the Middle East and Europe cause the dollar to grow stronger against the euro and franc. EUR/USD drops to 80 cents and USD/CHF rises to 1.12 to 1.35 range. The stronger dollar puts downward pressure on silver, sending it back down to $20. Season Two: It begins with the dollar taking a big punch (scene two of karate fight), being suddenly devalued, which crashes financial markets and causes silver and FAZ to skyrocket. That event will not be a market correction, but a major crash causing disruptions for all Americans. Bank holidays are likely. Next comes the collapse of the euro and Swiss franc, possibly due to losses incurred by European financial institutions due to exposure to derivatives. Season Three: I am expecting this to be a short season as the dollar continues to weaken despite actions by the Fed to prop it up. The Fed will likely proclaim all is well, backed by 24-hour mainstream news propaganda, but it will be far from well. This short season will be the final chance to liquidate all paper assets, including cash, and purchase real assets like gold and silver. By then, it might already be hard to find silver. Season Four: The dollar dies and all paper assets become worthless. Only real assets will have any value. Barter will temporarily provide a common means of exchange. Great civil unrest begins when government checks stop printing. A new gold backed currency is likely to replace the dollar. Despite the election of a new President with his appointments of many great people to administer his programs, the data presented in this post shows the final four seasons of the U.S. dollar are still right on track, which means we are moving closer to the death of the dollar. None of the warning signs have gone away. Instead, they are growing louder and louder. Trouble is coming, but the righteous have nothing to fear. God is far bigger than any problems coming our way. He is faithful to provide for all those who demonstrate their trust in Him by walking uprightly before Him. He has provided advance warnings so we can avoid or at least minimize the pain that millions will suffer. By properly positioning ourselves for it, we can help ourselves and help meet the needs of others who are hurting. The great shakings will be great opportunities for ministry. I was just thinking the other evening about the 1.35 and Karate dream etc and here’s the answers. Lovely summary of the events and pieces coming together. Thanks for this great site. You have such a gift of being able to put all the pieces of the puzzle together ! Greg Mannarino just went short the financial sector. Maybe some good news for FAZ holders. Thanks for the update. It’s appears that this is the year of the bank holidays (confirmed by 2018 wealth transfer dream I shared). If my understanding is correct the bank holidays should begin in June and after. My understanding is the devaluation comes after the bank holidays. That would surely fit the total chaos scenario that Mena Lee Grebin. Do you mean that It’s appears that this year 2017 is the year of the bank holidays ( dollar devaluation year ) ? Watch the Euro esp after the Dutch election March 15 and French election April 23. No specific Year was shown in the bank holiday dream, but 2017 seems very likely now. I study ” events: the first and second year of judgment ” from http://www.staffandswordministry.com/uploads/Walking_part4.pdf. — suppose these prophecies are true. 1. m.Stephani said the Lord tell him that Donald Trump would not finish his second year. —- which is before 20/01/2019. 2. You said Donald Trump will finish off federal reserve, and set up the gold backing dollar. 3. In the above prophecies, dollar will begin to slide in July ( 4. ) — means dollar devaluation– in the first year of judgment, and dollar will be worthless ( 37. ) in the second year. If the first year of judgment is year 2018 ( mean dollar devaluation year ) , then in the second year of judgment 2019, dollar become worthless first before 20/01/2019 in those 20 days — and in these 20 day Donald Trump finish off federal reserve and set up new gold backed dollar. —- this scenario should not be possible. The conclusion is that it should be in July 2017 US dollar devalue. ( then 2018 become the second year of judgment). Hope you will have prophetic words to confirm it is in 2017 US dollars devalue. On the other hand, Kat Kerr was shown in heaven that Donald Trump would be president for eight years and then Mike Pence would be elected president. Will the real revelation please stand up? After answering the humble prayers of Christian people, God can change things. The term of Donald Trump is the thing God has changed. If you want to seek answer, please seek God directly. God is a mercy God. He always change the thing to better. AMEN brother William. I wholeheartedly agree with you. Donald Trump was the answer to the cries of God’s people and thank you Lord for the electoral college which was most likely an insight the founders got from the Lord when they set up the election process. I’m looking for bank holidays as markers before the devaluation. Bank holidays will signal we are moving along in timeline. Phanuel, at the pace at which the prophecies are currently being fulfilled, I would be more inclined to think that the usd devaluation will happen in 2018. The Dutch and French elections will most likely drive the usd higher and we could see the 1.35 USD CHF in the next few months….but I am not sure that the big karate punch (devaluation) will follow shortly after …??? I agree. I wasn’t implying it will all happen with the elections. These events take time. The election results are symbolic of the unraveling of the European Union and hence the euro. So I expect these events unfold much later in the year into next year. Sorry I wasn’t clear. 23 (?) September 2017 is the end of Jubilee year. Our restoration should happen before this date. To a lot of Z3, US dollars devaluation event should cause the restoration. The “JESUS EIGHT DAYS” dream/vision occurs tomorrow. Rosh Hashanah is 20 September. End of Jubilee? In this video (https://youtu.be/gGDwGOjy6Oc) by Steve Fletcher, he explains why he believes that Nisan 1 (after sunset on March 27, 2017) is the first day of the Jubilee year, 5777 – as described in Exodus 12:2 (referred to as Rosh Chodashim rather than Rosh Hashanah which occurs in the fall on Tishri 1) even though the Trumpet is not blown until the Day of Atonement to consecrate the Jubilee year (Leviticus 25:8-13). In 1217, a Jubilee year, a Jewish Rabbi Judah Ben Samuel made a prophecy about the final 10 Jubilees before the Messianic Kingdom would begin (see http://www.fivedoves.com/letters/march2011/rauld324-1.htm). This same document provides much more detail about the Jubilee year (5777) starting after sunset on March 27, 2017 as referenced above by Steve Fletcher. Gary F, very interesting but how could 2018 usher in the millennial reign when we need seven years for the tribulation? I find it very interesting that the Reformation began in 1517 and in 1917 we have not only the Balfour Declaration but also the Russian (Antichrist) Revolution in Russia when they closed all the churches and Satan made his first move to rule the world. The hatred we see today in the left wing agitation is the flowering of this same Antichrist spirit. And look how the Pope is acting like the whore/harlot/religious Babylon of Revelation! Then in 1967 the Jews took back their sacred city of Jerusalem! The next Jubilee is fifty years away so is it being too sensational to ponder that the rapture and tribulation (in any order) are at the door? I think the Germany economy trouble would be a main cause to cause USDCHF get to 1.35, election result of Dutch and French alone should not be able to cause Usdchf get to 1.35. On March 14, 2017 the U.K. Prime Minister may decide on a forced Brexit “divorce” as the negotiations between the EU and the UK have not gone too well,; and then there are some of the Italian banks that are struggling, credit problems , liquidity problems etc…. When each time market swings big, some of big institutions will have to cover their margin call by selling their assets. This may cause the Germany economic trouble, which should cause usdchf 1.35. US dollar devaluation should be a plan event come out at the proper time. But anyway, we are still not sure us dollar devaluation event will definitely happen in 2017. But I feel it should be in 2017. FOMC increase interest rates on March and on June? — causing enough market volatility. Remember there is a prophetic saying that Germany troubles happens on 25th? And another one is saying it happens on a Sunday— not very sure on this one, but if it is true, then June 25th 2017 is the only date of being 25th falls on Sunday in 2017. ( the next two are: Feb 25 2018 and Mar 25 2018 fall on Sunday. ) When the Germany troubles start, it should be the moment for USDCHF get to 1.35. My guess is when Germany crashes the euro and franc collapse too, which would be when USD/CHF goes up to 23. But I think it should be euro dollar collapse cause usdchf go up to 23. — the Germany trouble may still cause usdchf go up to 1.35. James, I agree. When Germany collapses, the euro and the Swiss franc collapse too ! Ok, I am trying to boil this down to bullet points. How does this look? Warning signs intensify. Dollar gets stronger. Growing tensions between the American people. Then Silver drops back down. Silver may drop to $14.45? Drop in Equities. Dollar dives. Financial market crash. Silver and FAZ to skyrocket. Short Season: Dollar Weakens: Propped up by Federal Reserve, and Media. Dollar Dies. Paper Assets become worthless. Real assets keep value. Barter will temporarily provide means of exchange. ?Gold backed Currency replace dollar? My understanding is the Death of federal reserve dollar = death of federal reserve + implementation to gold backed currency. This is a transition period from now till next year. Yes, this will happen very soon. The gold backed TRNS will be released soon. Opps -final line- Civil unrest. James did God giving any update on this. That is will it still take place? Furthermore I noticed FAZ did not do much (12) when stock markets corrected heavily. Does it mean we are still in phase 1. I believe we are still in phase 1. The dollar must go up higher. Against the Swiss franc, I saw it go up to 1.35, which has not yet been fulfilled. If my understanding is correct we should see a hard downturn on March 23. This will count as Wave 4. It’s a 10 day count. The last 10 day count landed on Brexit 6/24. So March 23rd could be very significant. There is the possibility that the “10” could be a another day like “8” was Cheshvan 8 (Nov 8/9). Hi Phanuel, do have any other sites you could recommend to buy bitcoin? I’m still not able to download my drivers license onto Coinbase.. my husband tried on his desktop this morning.. I’m hoping the site is slow otherwise I don’t know what else I can do. Give it sometime… coinbase can be very slow. It takes longer with new users. To confirm…. I also saw USD/CHF at 1.35 a few months ago, so it’s an important sign post. Thanks for sharing that confirmation Phanuel. Second, that rate hike might not drive the Dollar index higher as is usually the case. The day a rate hike doesn’t drive the Dollar index higher,it is downhill from that moment on wards for the Dollar. David Stockman was Ronald Reagan’s Budget Director and is Robert David Steele’s choice to replace Reince Priebus as Chief of Staff. That’s how highly Stockman is esteemed by the very savvy Steele. Stockman says the country is quickly running out of cash and will be broke by Memorial Day with no chance of the Democrats raising the debt ceiling. Yet Trump has multiple big spending bills on his agenda including $100 billion for the military, fixing America’s infrastructure and building the southern wall. At the same time military expenses could skyrocket with war with ISIS and North Korea, not to mention the Ukraine. Trump has added 500 troops to our forces in the ME which is nothing when one considers that Russia had 5 million men ready for combat before Hitler launched Operation Barbarossa and had another 18 million in reserve. (The Chief Culpret by Vicktor Suvorov) The insanity or blindness of America’s neocons is beyond the pale. God allows this blindness to a nation in gross rebellion and ripe for judgment.